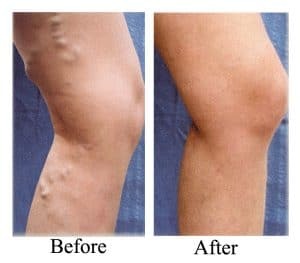 Now with a combined approach to leg vein therapy, it is possible to quickly and safely remove those unsightly veins of any size. Leg veins therapy and other treatment related to Skin are done at Prof. Dr. Ikram Ullah Khan Skin Clinic equipped with latest laser machines. stimulates the body to destroy and digest them over just a few weeks. No more cramping and pain of the older solutions. Laser is not the first line treatment in the battle against leg veins, smaller vessels. At last, there is a minimally invasive way to permanently rid of those large protruding blue veins. These can be painful and unsightly. Therefore, using only local anesthesia, we are able to surgically tie off and tease out those large veins and permanently removing these by small incisions. There by, preventing worsening of surrounding vessels. You wont miss a single workout or night out.